A few weeks ago, Horse News set out to track down some of the famous faces that have fallen off the fandom's radar since the ride began. 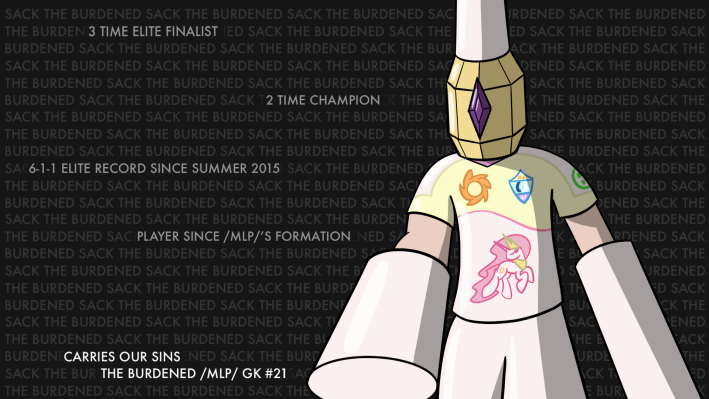 Well today, we are very excited to announce, that we've got an update on a living legend, The Burdened himself (also known as DutchScout on DeviantArt). 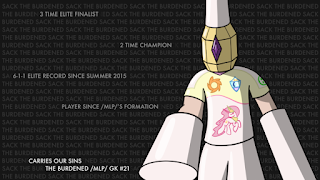 He's graciously given us a moment of his time to give everyone some background information on how one of the most famous cosplays in MLP history came to be, as well as his opinions on his status as an /mlp/ 4chan Cup Goaltender. Let's see what the man has been up to since he arrived on the scene almost 6 years ago. 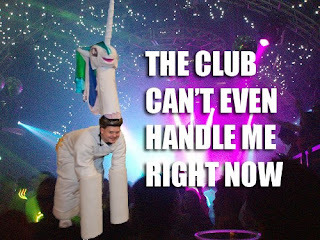 HN: How old are you now, and how old were you when you first made the Celestia cosplay? TB: I'm in my early 30s now and I was about 25 when I built it originally. The in-progress version was first shown at a Halloween MLP meetup. 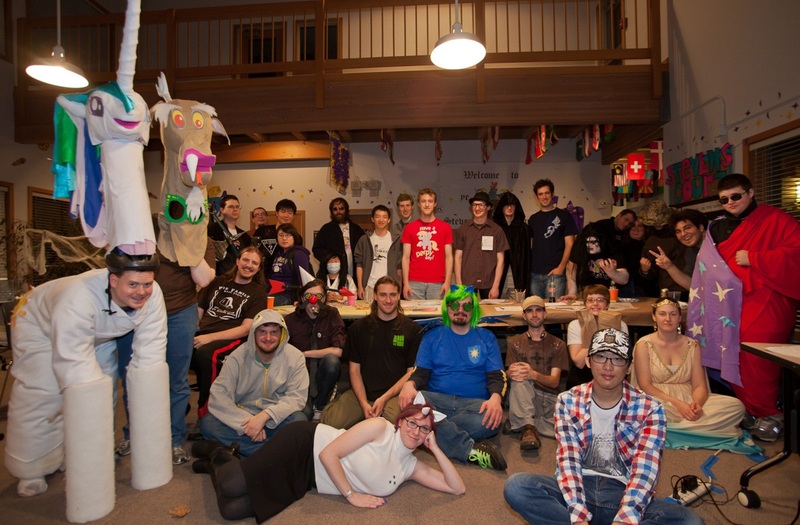 The photo of that meetup was edited by 4Chan to name the costume, along with others. The more finished versions appeared at Emerald City Comic-Con and Everfree Northwest 2012, where it was signed by Nicole Oliver. HN: What was the inspiration for the suit, and where did you learn to construct something so complex? TB: My wife wanted to make a full-size Discord costume. She made some progress on the head (visible in the meetup photo), but ultimately never finished it. I wanted to make a life-size costume as well. I'm kind of an all-or-nothing kind of guy, so I wanted a life-sized four-legged pony costume. I figured bringing ponies full-sized into the real world is the best I could do with a costume, so I looked for which ponies matched human proportions the best. Princess Celestia was closest because of longer legs, etc, so I went with that. Plus, it seemed like a reasonable companion for my wife's Discord costume. This was my first real costume project and turned out to be pretty complex. I learned a lot online and got advice from friends and family about various pieces. Almost all of the seams were hot glue, which is pretty awesome for working with fleece. I'm fairly proud of the horn, which is carved pink insulation foam, a hot glue spiral, with fleece stretched over it. HN: How long have you been in the fandom, and are you still active in it? TB: I joined the fandom in Summer 2011, between seasons 1 and 2, when my sister-in-law suggested my wife and I check it out (ironically, I resisted but my wife made me watch at least 1 episode). 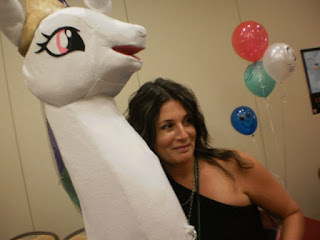 From then until about season 6, we were both pretty involved - starting a fan club at college, attending Meetups, holding meetups, doing several large-scale pony crafts (including the costume), and even helping start one of the many pony conventions. I still watch the show and follow some fandom things, but I'm a lot less involved now that our kids are growing up. HN: What major events have happened in your life since the show began? Do you have a career path you're working on / any achievements you're proud of? HN: Are you familiar with how much of a meme your suit became? How do you feel about having been referenced in the show itself? 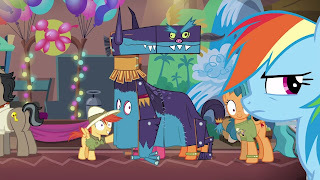 It is pretty cool to be referenced in the show itself - I love in general that MLP has been responsive to things like that. HN: Have you heard of Pro Evolution Soccer? TB: I've only really heard of it in context of the Burdened and the 4chan competition, while discussing the costume with some bronies at a convention a few years ago. HN: What do you think about having a video game character based on your cosplay? TB: I think that's pretty cool! HN: Have you ever visited /mlp/ or Ponychan? 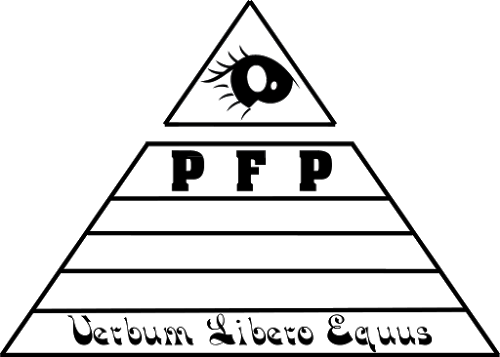 TB: I've managed to avoid 4chan so far (I tend to be pretty G/PG), but I have looked at some specific boards on Ponychan for a fan-related project I worked on a while ago. 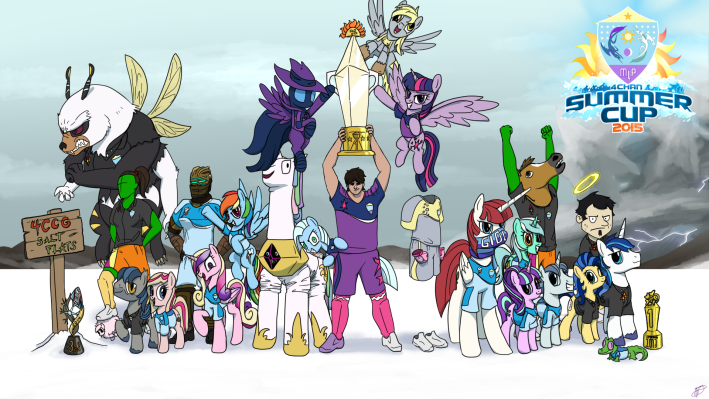 I'm aware that derpibooru has a 'the burdened' image tag, which is pretty funny. HN: What are your other hobbies or interests besides ponies? TB: Current hobbies include making chocolate from scratch, learning to grow food from scratch (bread, sugar, peanut butter, etc), collecting and playing old video game systems, and DnD (currently in 5e). I'm also really involved in my church (Latter-day Saints) and, of course, I spend a lot of time with my kids. HN: What was the general response that you got to your costume? TB: The response was... not great. First, I made the mistake of bringing out the costume before it was finished (the picture where it got the name 'the Burdened'). Even after reaching its 'final form', I think the uncanny valley effect was really strong. A few have told me they think it's really cool, but most tell me it's going to haunt their nightmares. 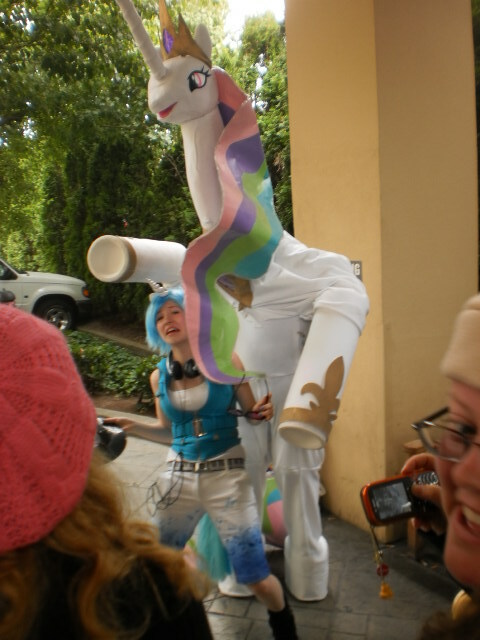 To be fair, I understand both sides - when we converted the costume to a statue to send to a charity auction, I had a 7-foot Celestia in my living room. Imagine seeing that thing at night in the dark! It was cool getting to show it to both Nicole Oliver and Tara Strong and sharing it at conventions. It was also fun taking pictures with people and giving short rides, though as a full-body duct tape bodysuit it was difficult. Overall, I consider it a successful engineering project and a good experience, but I understand why it's become a meme for being somewhat cringey. HN: Anything else you'd like people to know about you? TB: Applejack is best pony. PS - I'm interested to know where the costume is now, if someone knows. If I remember correctly, it sold for $250, but I think the brony that got it was surprised he won the bid, so I wonder where he put a 7-foot tall Celestia statue! 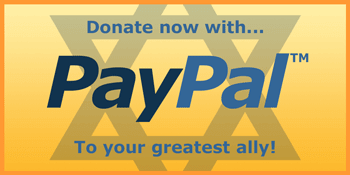 Someday, I'd love to see it go through a drive-through or something. HN: Thank you DutchScout on the update, we're glad to hear you're doing well and hope the best for you. If you have any idea what happened to that statue, we'd love to pass the information along. Also if you were expecting an update on another story, don't worry it's coming, there's just been some communication issues on our end. Expect more soon. Nice to see The Burdened is no longer... well, burdened. I gotta say, really liking these "Where are They Now" stories. Keep up the good work HN. Huh, he's been referenced in the show and in a video game? Source? Where exactly was this statue sold? I don't really recall that having happened. I'd love to know where it ended up too. That's fandom history.